She’s a quiet woman, shy and unobtrusive and definitely not wanting to call attention to herself – except in her artwork. “I like to paint big – big canvas, big watercolors, big subjects, big brush strokes – the bigger the better!” says Kerry Hansen, a Wyoming transplant who lives and paints in her studio outside of Licking, Mo. Her experiences with working cattle, riding horses, and training and showing foxtrotters have also allowed her to develop an intrinsic appreciation for the way animals move. Her farm near Licking, where she lives with her husband, Jim, and hundreds of animals – including cattle, horses, goats and any stray dog or cat that happens along, sits atop a hill. From most windows in the house, she can see fields and valleys dotted with livestock. The house is a showcase for not only her artwork, but also for other Western artists’ work that she admires – Larry Glaze, Nancy Glazier and many others. She recently finished two murals for Friends Lumber that hang on a side wall of the downtown location. 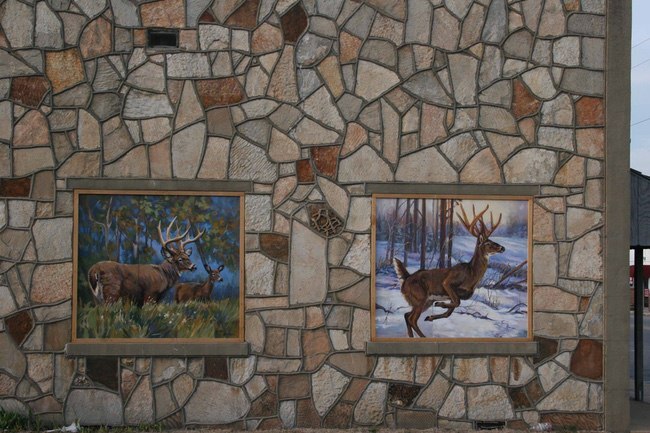 The murals each feature white tail deer, painted with a winter and a summer background. She also has painted murals for the Ferguson Building in Rawlins, Wy., and for a private home at the Lake of the Ozarks. As in her artwork, she likes to keep the perspective large on her murals. Before working on the project, she draws a much smaller sketch of the mural, starting with the horizon line to “get a feel for where I am.” She then adds the biggest shapes and works down to the small ones. She says, “The reasons I like bigger murals is because you can do something big and it looks good. If you’re doing a little mural, you can be off a sixteenth-of-an-inch. It can look really bad.” She uses acrylic paints made especially for the outdoors and treats the finished painting with a UV coating. She adds, “It’s just a lot more expressive for me to paint big.” She has been commissioned to paint a mural in Carthage for the Catch a Dream Foundation – a non-profit organization that arranges for children, 18 years and older, who have life-threatening illnesses to experience outdoor adventures. 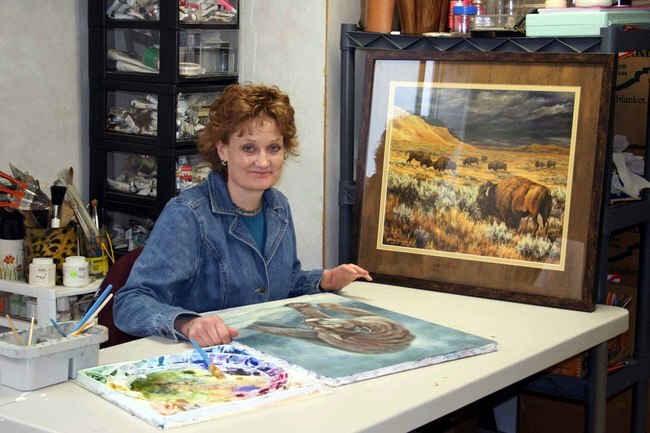 During the past 12 years she has been honored with several national awards, and two of her paintings have been on exhibit in the White House as result of winning the Congressional Award in 1994 and 1995, sponsored by the Wyoming Arts Council. 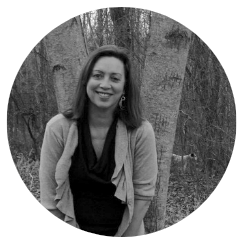 She has also won numerous awards at the regional and statewide levels, including Best of Show in an Audubon Show in 1993. When not at work in her studio, she might step over into the indoor horse arena next door and work with one of her four foxtrotters. She competes on them in the South Central Missouri Association of Foxtrotters circuit. At present, she is also furiously working to save baby goats. This Missouri spring has had its share of cold snaps, and she has been busy shuttling baby goats into the house to warm them by the fire. The Hansens’ goats recently birthed eight sets of triplets in two days. After the “kids” get some help and can function on their own four feet, she hopes to get outside into the Ozarks more this spring – perhaps even go gigging for frogs. Who knows? Maybe frogs and wild turkeys will find places in her future work. 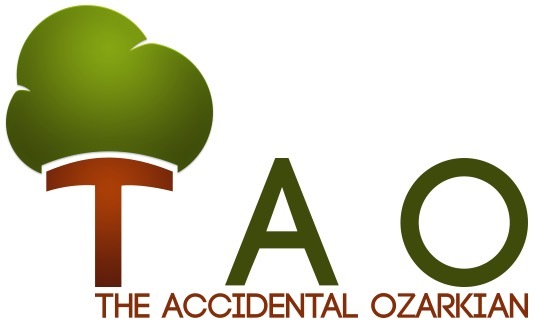 This is a retro-Ozarkian, first published in the spring of 2006.